Black poly pipe, commonly used for underground irrigation water supply, is subject to holes, cracks and breaks due to a freeze/thaw pattern or damage from ground pressure. Black poly pipe is a flexible, thin-walled, plastic hose used primarily for its ease of running around obstacles. The thin nature of the pipe wall makes it somewhat fragile and the need for repairs is common. 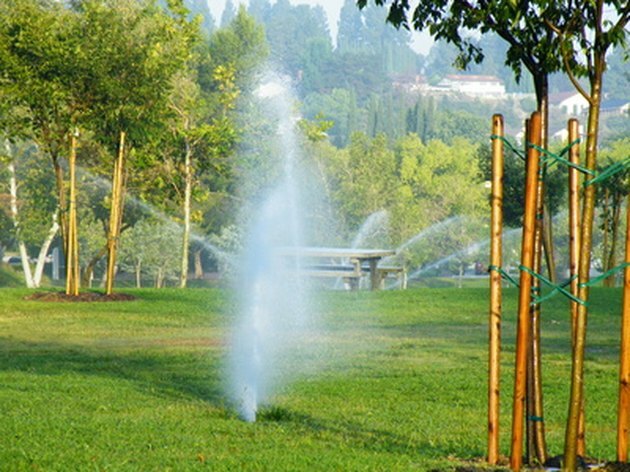 Poly pipe is frequently used for underground irrigation. Contact local utility companies to mark the area for gas pipes and other underground utilities. Turn off the water supply to the poly pipe at the main valve. Dig up the pipe carefully; a slip of the shovel easily slices through poly pipe. Dig the hole long enough and wide enough to expose damage and allow an area big enough to work in. Use a hacksaw to cut the damaged area out of the water line. Cut 2 to 3 inches past the holes in each direction. Bring the damaged section to the store to match and exact diameter of poly pipe and size of the barbed poly pipe joint fittings. Cut the new piece of poly pipe to exactly fit the missing section. Use a hand-held hair dryer to heat the existing poly pipe, new poly pipe ends and fittings. Heat will slightly swell the plastic and ensure a good, tight fit. Do not over heat because the plastic will melt and cause more damage. The poly pipe is only warm after proper heating. Place a barbed poly pipe joint fitting on each side of the remaining in-ground pipe. Fit the new piece of poly pipe into the fitting. Place a poly pipe clamp around the fitting and tighten the clamp with a screwdriver. Do not over tighten because the fitting or pipe will break. Repeat on the other end of the pipe. Turn the water back on and check for leaks before back-filling the hole. How do I Loosen a Stuck Threaded Brass Fitting?